Oh my gosh! 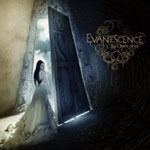 I love Evanescence and her music so much! I love her music videos and she is my hero! She is the most inspiring person ever! If I could ever see her, I'd tell her how much I love her!!! the clip is one of the most incredible i have ever seen!!!!! !they are GODS!!!! I love it its amazing !They all have so much talent.And that song totlay goes for my ex bf.And the guy in the video is a hottie!Rock on! EVANESCENCE! I SO MUCH LOVE U!! YOU ARE THE BEST!!! THIS SONG AMAZING! THANK YOU!!!!! p.s. someone tell me, please, when i can bue CD in Europe? This song is extremely awesome. Well, to be direct, when I heard this song for the first time, I thought the song kinda boring. But when I listened to guitar part and piano plus the melodious tune repeatedly, it's the best new element they brought this year. The video is great too, the best part is when Amy smiled at the end of the vid. Fantastic! Can't really wait the album. Amazing!! The guitar sounds a bit edgy-er than previous albums. Anyone agree?